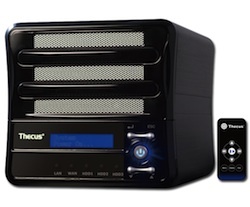 Thecus are a popular manufacturer of NAS hard drive storage units, they make a lot of NAS equipment aimed at both businesses and home environments. Many Thecus systems run RAID technologies, often RAID 0 or RAID 1 for their smaller 2 disk NAS storage systems, and RAID 5 for their larger systems comprising of 3 hard disks or more. A NAS data storage system such as a Thecus is a great solution for businesses and home environments that process large amounts of data, but just because data is held on one of these systems doesn’t mean the data is now safe and can never be lost. With a Thecus NAS running a RAID 5 configuration, if one hard drive fails then it is essential the hard drive is replaced when possible because when the hard drive isn’t replaced it causes damaging issues as it’s expensive to get data regained, if another hard drive fails. When one hard drive fails the RAID array enters a critical state where read and write rate is reduced massively but it’s still possible to read and write to and from the hard drive. Bear in mind that RAID’s aren’t a backup solution they are there to supply fault tolerance. Losing drives from the Thecus isn’t the only way data can be lost from these NAS boxes, files and folders can be accidentally deleted or overwritten, and because all the NAS data is stored on hard drives, failure and data loss can occur should a disk fail. You can read about the common forms of disk failure here. Because the data held on a Thecus NAS is typically written in a RAID 5 configuration, recovering the file and folder data from a Thecus NAS is not a straightforward task. This is because the data is written in chunks across the disks, so for example if ‘File A’ was written to a 4 disk Thecus RAID 5 NAS box, that file would be stored in separate chunks across the four disks. The redundancy of RAID 5 means that one of the hard drives can fail and the NAS will still operate but losing a second disk will cause the Thecus box to fail. Restoration of files and folders is an expert task and should not be attempted if the data on the Thecus NAS is valuable, instead use a professional service like Data Clinic’s Thecus NAS Recovery Service to get your data back.